Samsung's Galaxy Tab S3 - one of the best Android tablets of 2017 - is about to get a successor that's unsurprisingly called Galaxy Tab S4. Not long after seeing a black version of the Galaxy Tab S4, we can now take a look at a white variant, albeit this is encased in an optional keyboard cover (so there's actually not much whiteness to glance at, as that seems to be exclusively covering the slate's back). Revealed by reputable leakster Evan Blass (aka @evleaks), the white Samsung Galaxy Tab S4 is accompanied by an S Pen stylus - this looks slightly different from the S Pen of the Tab S3. Most likely, the stylus' functionality has been enhanced, although, for now, there is no word on exactly how. 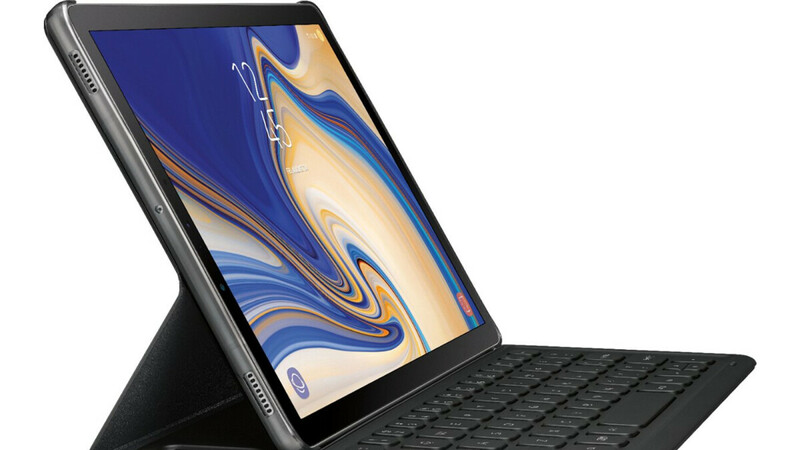 Specs-wise, the Samsung Galaxy Tab S4 is expected to offer a 10.5-inch display with 1600 x 2560 pixels, a Qualcomm Snapdragon 835 (not 845) processor, 4 GB of RAM, and a 7,300 mAh battery. The Galaxy Tab S4 will probably be sold bundled with its S Pen, since that's the case with the Tab S3. For now, the new tablet's price and release date are unknown. However, the slate could be officially announced at IFA 2018 (August 31 – September 3), possibly alongside a Samsung Gear S4 smartwatch. Stay tuned. Could have been worse if they went with 16:9. Also good thing is the S4 will drop the price of the S3. Might get one of those instead for the more paper like aspect ratio. 4:3 is stupid for watching content and playing games in landscape ... pick your poison. Yup, it's a silly aspect ratio for a note-taking tablet. They certainly had to produce a 10.5" tablet to compete with the iPad Pro, but Samsung being Samsung, they had to get it wrong. The statement "the Tab S3, one of the best Android tablets in 2017" is wrong. It was one of the ONLY Android tablets of 2017, and pretty much the only major OEM one outside of Asus and Huawei. Snapdragon 835 tablet priced a premium price... Let that sink in for a bit.. So happy they're going back to 16:10 ratio screens. Leave the squares to iPad users and let me do real work with more space. I'm a little worried the digitiser won't be as good this generation. Fingers crossed it's still Wacom's EMR. Mathematically, 4:3 will give you more area for the same diagonal length. Why are we getting overpriced tablets with last years specifications? Android high-end tablets are pretty much dead. This should have at least SD845/6GB RAM/128GB flash/fast SD-card slot, but no, full of last years specs. And the price will be outrageous. I hope that Apple and Microsoft destroy Samsung's last tablet sales. With crap like this, they deserve no sales at all. "For now, the new tablet's price and release date are unknown." Not to mention raw power is more than enough for limited, mobile tablet stuff.